Carol Wiebe Wonders Out Loud | Can you hear me? I took a FULL year to let retirement sink into my bones, to think about what I wanted to do next. I wasn’t sure I wanted my art life to be public anymore, but a number of different “encouragements” convinced me otherwise. Not that I have been doing nothing, art wise, for a year. I might as well decide to stop breathing. I just haven’t shared any of it, or paid much attention to anything other than my own inner urgings, thoughts, and emotions around it. There were a few things we had to clear up between us, Art and I.
I’ll be sharing soon, showing the direction I’m heading. Maybe I’ll reveal some of my experimentation of this last year. 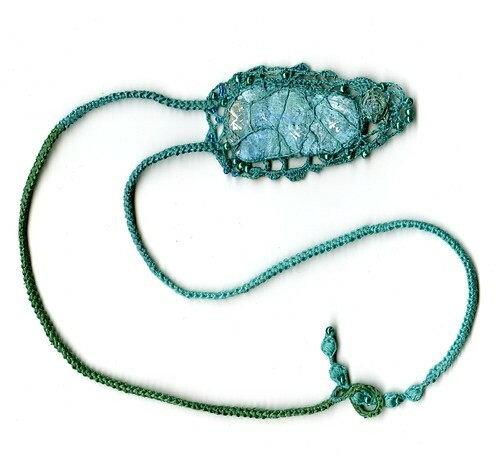 Like paper and thread jewellery, for instance. If you followed me at one time, please be advised that I am going back to my home, Silverspring Studio. It feels right. I am not going to post in several blogs. I’ve said before, I’m a monogamous blogger. Websites are another story (wink, grin). I don’t usually talk about personal family matters in my blogging. But I am making an exception in regards to my oldest son, who works in advertising as a Creative Director. I gave birth to Jason when I was 19, and have always laughingly admitted that I grew up along with my two sons. Frankly, there wasn’t much use in telling either of them, from a very young age, what to do or think. They both had confidence in their own abilities to figure out what they wanted and the best way of getting it. Our parenting style was the sharing of ideas, skills, and strategies. If either son felt drawn to something that my husband and I had doubts about, Jason or Michael’s job was to convince us why such actions were called for. Both sons were, and are, excellent negotiators. Fast track 40 years later to Jason’s full and creative life. He is a fascinating man: brimming with energy, ideas, humor and wicked ability in computer games. He is also dedicated to his wife and children, and it has been a real joy to see him embrace that role. He and his wife, Dayna, have built a life for themselves with the realization that not only are challenges to be expected, but they are what instigate growth and open up new possibilities. This week, they were hit with a very sizeable challenge. On Wednesday, November 21, Jason had a stroke. Thank God he had it in full public view, among caring colleagues, rather than alone somewhere or on a plane or in his sleep. He was 10 minutes from St. Michael’s hospital, which offers highly specialized neurological and trauma services. He was soon joined by friends and family who are more than willing to do whatever it takes to ease his way on the road to recovery. But the fact remains: he had a stroke, and at quite a tender age. So what is a parent to do? Whatever we can: pick up the kids from school, sit in the room and watch him sleep, arrange pillows, pull up blankets, buy Gatorade. I came home from the hospital and watched an interview and slideshow, followed a few links on his website. All to remind myself of the way he thinks and how very much I always enjoy being privy to his creative thought stream whenever we get together. This time, I needed Kleenex. But as impressed as I have been with Jason’s accomplishments, I have never been more moved by his actions than this week. There have been no curses, bitter words, or wailing self pity. None. I have only heard him express gratitude for the timing of the stroke, the quality of his care, the support of people around him. He has already vowed to jump into rehabilitation, with characteristic determination, to regain his losses. I have seen Jason pick himself up from serious tests in life before, and once again his positive, courageous approach inspires me. My heart feels heavy with the weight of this “hit” to my son, but it is also singing because of the consummate quality of his response. Ontario falls are spectacular. The trees turn into giant, technicolored flowers. They are every shade of yellow, orange, and red, with vestiges of green. It’s breathtaking. But the delights of fall are not over even when the leaves drop to the ground. I love their musty smell, the papery sounds my feet make crunching through mounds of them, the percussive songs their partner, the wind, performs with them. Why does everyone rush to bag them, contain them, get rid of them? Are these people oblivious to the many ways leaves reward the senses? There are those who would make small tsk-ing sounds as they walk past our yard. They might call us lazy, or lacking in tidiness. But I say, we are among those who honor leaves, who understand that they must be allowed their full glory. I made another decision during my hiatus from blogging (first decision here). I enjoy being practical with my art, and want to focus on making artistic additions to our home. Right now, I am learning how to do mosaics. If I was smart, I’d make a coaster or two, or perhaps a coffee table top for practice. Instead, I started on a bathroom floor. Good luck getting rid of this project if it doesn’t work out. Luckily, my husband is the one breaking and grinding the pieces. I have the fun job of putting them in place. This is not as easy as I first thought. The little black outlining tiles were one thing. The filler tiles are another. My aim is to achieve a flow in the placement of many irregular shapes. This is followed by “buttering” the tiles with a cement mixture. It’s almost hilarious how simply plucking a piece up, buttering it and placing it back can lead to fitting problems. If the pieces touch, clippers are required on adjoining pieces, followed by rasp work, so there will be no sharp edges for our delicate feet to deal with later. Oh, and my husband provided spacers to put on either side of the tiles, along with a bridging tile, to keep my tile heights even. He is such a hopeful man, believing the floor will be perfectly even because of these measures. What should you expect when you buy a bunch of tiles that do not have uniform thicknesses from a store carrying second hand and remaindered items? Personally, I think a perfectly smooth floor is an unrealistic goal. A few slight height variations add character. 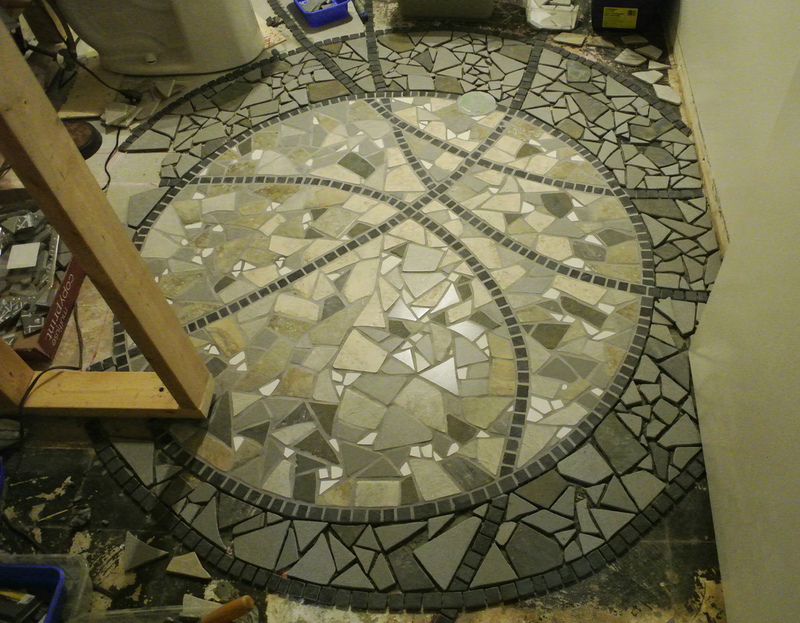 The center “medallion” is already grouted. The gray pieces on the second layer are buttered and the cement is dry. There are a few gaps here and there where pieces have to be shaped to fill them. Off I go to work on the last layer. My knees are complaining already ~ I have been spending quite a few weeks on them. Nahhhh. I try to avoid drama when possible. If I can see something, and it keeps repeating itself, letting me know it wants to get done, it’s worth doing. Therefore, I have committed myself to translating some of my digital pieces into versions I can hang on the wall. This is challenging. The different versions speak different languages. A digital work has light behind it. It is translucent, it glows, it shines. A canvas will only do that if you have the skill to apply the paint to that effect. Even if you are able to do that, it is still an effect. It does not have an actual light behind it. As a former stained glass artist, I know what an advantage that is for attracting attention. Or, at a certain point, the work takes on a life of its own and is derivative of, but not identical to, the piece that inspired it. 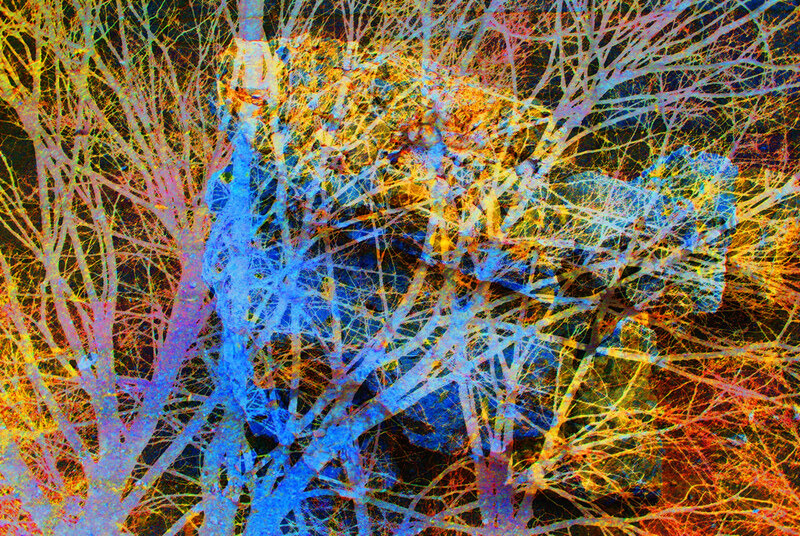 I spent a year and a half creating at least one (usually 10 to 20) digital works every day. While it is true that these works represent a valid form of artistic expression that can stand alone, I feel the urge to push myself into what I see as another step. I have the vision for it, so I will follow what I see. The world is so rich, simply throbbing with rich treasures, beautiful souls and interesting people. Forget yourself. How fortunate am I that my work allows me to do just that. And it allows me to express the other as well ~ to depict the rich treasures, beautiful souls and interesting people my life brings my way. Tomorrow will mark another milestone for me, 18 months of continuous daily blogging. I’ve had my ups and down, but always managed to say something, and provide an image. So now what? Why announce this fact in such an obvious fashion? I worked for months making delicate “granny squares” out of thread. 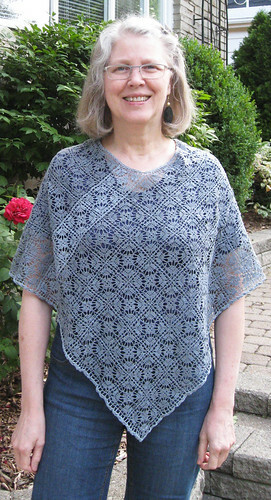 I finished a “poncho,” which I blocked in time to wear for my last day at school. My neighbor, good friend, and food guru Wendi Hiebert, snapped a few pics of me that morning in front of her rosebush and sent them to me last night. 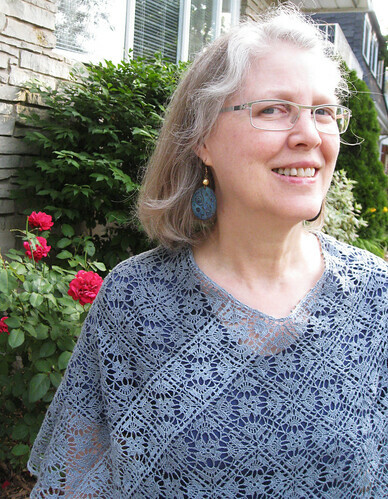 Carol wears her own handmade crochet. Yesterday was my last day of “regular” employment. In other words, I have joined the retirement crowd. It was an emotional day ~ with hugs all around from staff and students alike. In my mind I saw a curtain closing on my former life and opening to reveal a new vista of experiences. I now have the privilege of asking myself, What do I want to do next? Who do I want to be? I have freeing, intriguing choices to make. And today is my first day to start making them. We can see the world as a doomed place, bound for destruction and full of people who only consider the bottom line. However, if we allow it, we will also notice and experience the many acts of kindness that are extended to us, as gifts. Sticking our heads in the sand and pretending everything is goodness and light may be refusing to face “reality,” but putting a bag over our heads and denying there is any goodness and light is equally delusional. Sunshine and shadow. Love and hate. Violence and gentleness. Meanness and kindness. All co-exist around us. Given the choice, I would much rather tally kindness and generosity. My scoreboard has HAPPY LIFE written on it. May I receive such gifts graciously and pay them forward.